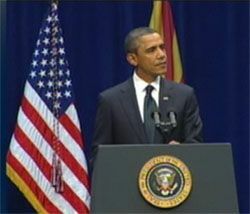 President Barack Obama is addressing the nation in Tucson at the memorial service for the victims of the Arizona shootings. You can watch live here. "Bad things happen, and we must guard against simple explanations in the aftermath," Obama said at a memorial service for the victims. "The truth is that none of us can know exactly what triggered this vicious attack. None of us can know with any certainty what might have stopped those shots from being fired, or what thoughts lurked in the inner recesses of a violent man's mind," he said.